39 Old London Road, Kingston upon Thames KT2 6ND Unique, well loved garments and accessories for men and women. That Vintage shop is a treasure trove where no two items are the same. Guests to take their time, have a cup of tea and take a trip down memory lane. 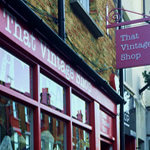 Visit the Pop-up store at The Market House in Ancient Market Place KT1 1JS. 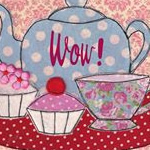 While you are there, take tea and cakes a the fabulous vintage tearoom upstairs. Sunbury Antiques Market: This colossus among markets has been going for 30 years in the grounds of Kempton Park Racecourse. There are over 700 outdoor and indoor stalls selling antique furniture, clothes, jewellery, garden ephemera and collectables of every description. Trade, public, interior designers and prop buyers turn up for this event on the second and last Tuesday of the month. It opens at 6.30 am and runs to around mid-day.